Canada's oil and gas industry is under increasing pressure by all levels of government to provide a safe work environment for lone workers in the field. Constant and reliable communication between the dispatcher and the driver is critical as part of any solution. Many oil and gas producers and their service companies are challenged by their working conditions such as climate and terrain and economy. Increasing economic pressures also means that companies need to mix and match drivers and vehicles to optimize their resources. As part of improving our lone worker solution, GEOTrac has launched driver identification. Until now, GEOTrac tracked vehicles by unit number, now GEOTrac can associate specific drivers with specific vehicles. The hardware chosen for this solution is the iButton. It is a simple yet reliable device that serves as an electronic registration number for automatic identification. Every iButton is factory lasered with a guaranteed unique 64-bit registration ID that allows for absolute traceability. Its stainless steel package is highly resistant to environmental factors such as dirt, moisture, and shock. This coupled with its flexible design allows it to be used easily by oil and operators. Each iButton shall be attached to a FOB, as shown below. The FOB is a small lightweight identifier that can be attached to a key ring. A unique identifier in the FOB is connected to a profile within our web-based application, Asset Control Center. 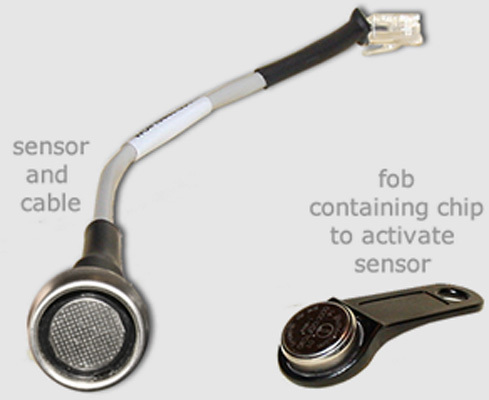 The FOB is swiped past the reader that is installed in the vehicle. This information is relayed with the unit number back to GEOTrac to be including in the reporting service.